If your suits and shoes are bespoke, why not your Panamera too? Porsche has always offered custom options through their Porsche Exclusive program; today, they announced the same treatment for the new Panamera. Need to keep your Reisling chilled while you drive? Simply opt for the rear-seat refrigerator. Want your air-vent louvers painted to match the exterior color. Not a problem. What's that you say, you want your Panamera complete with Turbo style air intakes. They can do that too. The basic idea is if you can think of it, Porsche Exclusive and Porsche Tequipment can make it happen, at a price. Porsche's full press release is at the bottom of this post. I took a base Porsche Panamera Turbo (if there really is such a thing as a "base" Turbo), with a price tag of $132k, and with a little bit of work turned it into a $200k + rolling refrigerator that can do zero to sixty faster than any other German appliance I can think of. I spent a bit of time playing with Porsche's Car Configurator to build my Porsche Panamera. I'm pretty sure I included everything available. My final price tag.... Wait for it.... $201,295. Try the Porsche Car Configurator for yourself (it's a fun tool in itself) and let me know if you can build one more expensive than mine. Through Porsche Exclusive and Porsche Tequipment, Porsche enables customers to refine and personalize all Porsche models individually, tailoring them to their specific wishes beyond even the sophisticated range of standard features. The new Panamera is no exception, giving the customer the option to turn the car into a truly unmistakable one-off masterpiece, with Exclusive features fitted straight from the factory or Tequipment components fitted later at a Porsche dealer. With Porsche’s new Gran Turismo, the focus is not only on using the best materials such as leather, wood, aluminum or carbon, but also on achieving a perfect finish. Craftsmanship of the highest standard is perfectly tailored to the individual customer; stitching and threads are applied by hand with. The many years of experience of Porsche Exclusive’s experts are demonstrated in the hand-finishing of the Yachting Mahogany interior package. Inspired by yacht building, light maple-wood inlays on a dark mahogany background feature on the dashboard, the doors and centre console. Additionally, grab handles on the roof lining as well as a special three-spoke multifunction steering wheel add the final touch to this unique finish. Within the interior, Porsche Exclusive again offers a wide range of further options. The louvers on the air vents, the sun visors, the interior mirror, the trim cover on the steering column and the seat console front and rear, for example, are all available in top-grade leather. Or, customers can request individual elements and components finished in body colour, including the louvers on the air vents and even the key to the car. The Porsche logo on the headrests, can be embossed on the front and rear seats. A special PDK gear selector lever, rendered in aluminum, can be ordered, as can instrument faces and Sport Chrono stopwatch in Luxor Beige, Indian Red or Carrara White. As matching elements, the seat belts are available in Silver Grey or Indian Red. The customer can also specify illuminated and non-illuminated door trim bearing the model designation in either carbon or brushed aluminum. Another highlight in the wide range of Exclusive and Tequipment features is a new cooling box positioned between the two single seats at the rear. Switching on and off on demand, the cooling box reduces temperatures to approximately 6 degrees celsius. It comes complete with two stylish glasses with the Porsche logo. The Panamera is also available with Porsche Rear Seat Entertainment, a newly developed entertainment system comprising two high-resolution seven-inch colour displays in the backrests of the front seats, as well as individual players and two cordless infrared headsets. The leather-covered display units each come with a USB interface, while the whole system is controlled by touch screen. 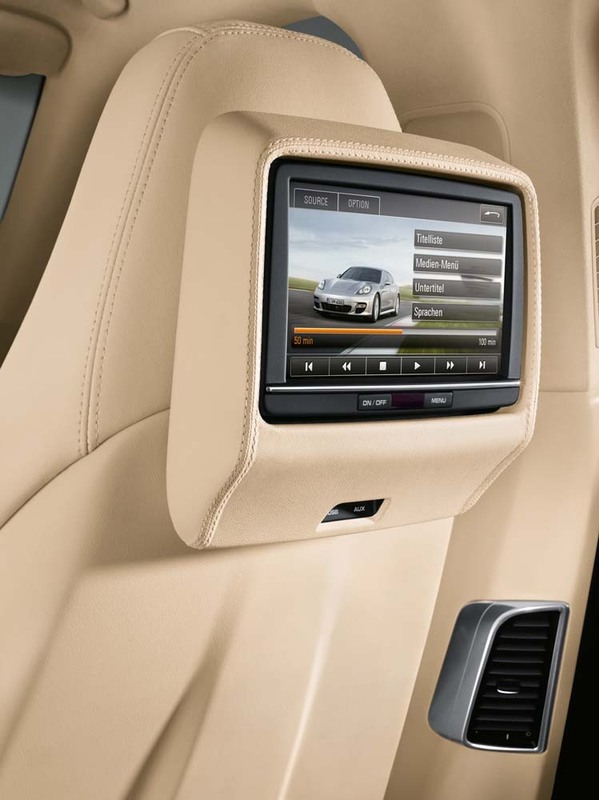 Immune to vibrations, the Porsche Rear Seat Entertainment System plays DVDs and CDs, with connections for two separate, individually controlled AV sources as well as a game console or an iPod®. The sporting and elegant look of the Panamera can be enhanced by air intakes at the front, air outlets on the side and the lower rear panel and diffuser finished in body colour. Porsche Tequipment offers all kinds of racks and attachments for the Porsche roof transport system to further increase the Panamera’s versatility. A bicycle rack made of aluminum is also available and can safely transport up to two bicycles. Apart from new Porsche child seats, a complete set of cases and bags tailored to the luggage compartment and a 12 V cooling bag, Tequipment also offers a wide range of audio and communication features for the new Panamera, interior packages, steering wheels in carbon or wood as well as a special wheel and tyre combination for summer and winter driving, ranging in size from 18 to 20 inches. Both the Panamera Exclusive Catalogue and the Tequipment Catalogue will be available later this year at Canada’s 12 Porsche dealers.